High-Heeled Foot in the Door: Last Chance: Give-away day! Had to share one more sneak peek into a current e-decorating design that I'm working on. It's a bit outside of my design style, but that makes me love it even more. Your home should look like you! Even if you hire a decorator/designer for help make sure your style shines through. If you need a little help in your decor today's the last day to enter my give-away! 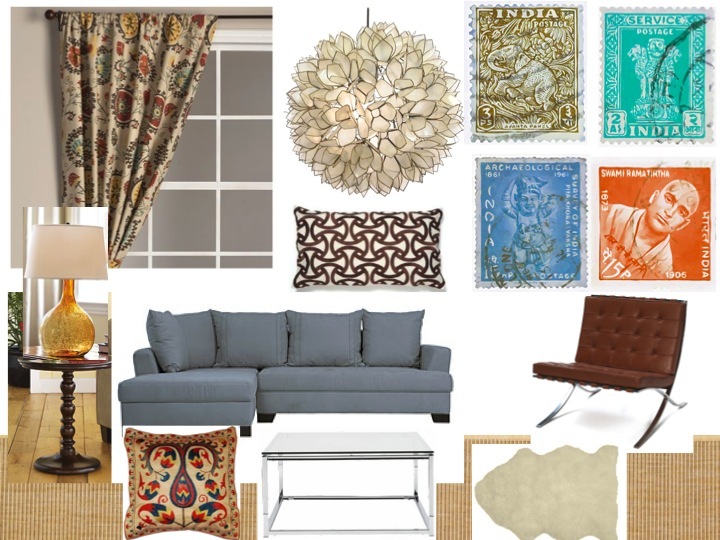 Camilla, I love the e-decorating mood boards you've been showing us - such a gorgeous job! where is that light from? I love it! Beautiful!! Are those postage stamp prints??? Love the throw pillow, too. This look greats! I have always loved that light fixture and dream of having it in my home someday! Those postage stamps are free! I'm going to be blogging about them next week. Stay tuned. I am loving these boards...I am so lost at how to put my ideas into play and would so love to have some help!